You'll need to choose the right kitchen sink for a kitchen revamp. Sinks are a vital part of the kitchen work triangle, so size and functionality are important, but you need to consider it alongside style. Your kitchen sink will be used multiple times every day, and you won’t necessarily be looking to replace it for a long time, so think carefully about the material and colour that you want, as well as how easy it is to clean, too. Find out more about redesigning your kitchen in our guide. Stainless steel is a practical choice that's hardwearing, long lasting, and easy to clean, although they can dent if heavy objects are dropped on them and, over time, will be covered with fine scratches. Sinks in stainless steel are an affordable option and can add contemporary flair to a kitchen worktop. Usually available in a range of finishes: polished; silk; brushed; and linen. Read our guide to cleaning stainless steel. Composite sinks are made from a combination granite stone dust and acrylic resins, are designed to have the looks of granite without the price tag, although they are more expensive than stainless steel and ceramic sinks. Ideal for contemporary kitchens, they can withstand high temperatures, are incredibly hardwearing and are hygienic, although they can be discoloured by harsh chemicals. The various stones used in their composition means that there are a lot of variations in colour and texture. Ceramic is traditional and will suit any kitchen style, but especially country style kitchens, Shaker kitchens and farmhouse kitchens. Ceramic sinks can become stained over time; but with good care, ceramic sinks can be very long lasting. 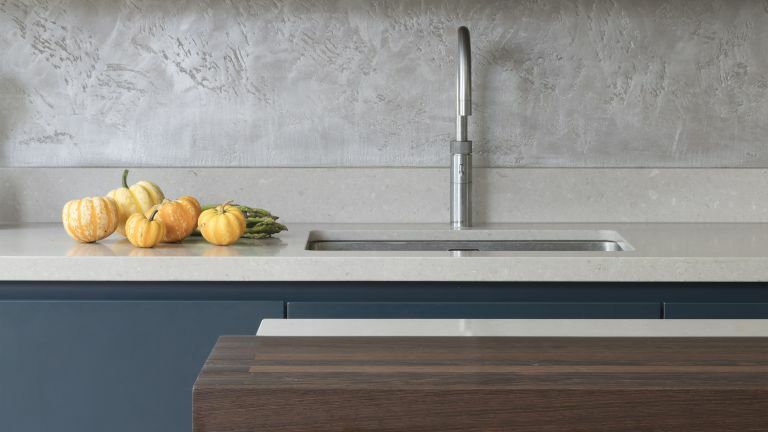 Concrete is a beautiful material for a kitchen sink, albeit expensive. Available in its natural colour, it can also have pigments and aggregates added to create a variety of finishes and colours; it can also be polished to a high gloss, and treated for ease of maintenance, although it will, nonetheless, develop a patina as it ages. Corian is another top end, but stunning material for a kitchen sink. Highly durable, stain resistant, hygienic and easy to maintain, sinks in this material come in a range of colours and styles, with a variety of edge treatments, inlays, configurations and fitting options available, including a 'moulded' where the sink is a seamless continuation of your kitchen worktop. The most important factor in choosing your kitchen sink will be its size. The bigger the kitchen, the more freedom there will be to add drainage boards, second and third basins, half basins and waste disposals. Built in drainage boards are common on both composite and stainless sinks. While ceramic draining boards are available, they are likely to be damaged through frequent use. Single bowl sinks, usually combined with drainers, are ideal for small kitchens, offering plenty of space in which to wash big pots and pans. They usually come with a drainer section where you can leave dishes to dry. 1.5 bowl sinks have a small bowl next to the main sink bowl and are ideal for extra washing or draining when the main bowl is in use. Two bowl sinks are really useful in family-sized kitchens. All bowl configurations can be surface-mounted, inset and come as Belfast or butler sinks; each can be used with any worktop material. Classic kitchen sinks are square or rectangular, but if you are planning a small kitchen, you might like to choose a circular sink, which saves on worktop space, although most come without a drainer. Another option is a corner sink, which can help you design a more efficient room layout. Smaller sinks aren't just for small kitchens: they will be handy buys if you are planning a utility room, too. Most inset sinks come with a drainer included. Under-mounted sinks can either sit within a worktop and you can buy a dish rack; better still, a drainer can be factory-cut into the worktop material. Universal drainers can be positioned either side of the bowl. These sink/drainer combinations come with two holes cut in the sink top, one front and one back. The tap will be fitted through one, the other will be sealed with tap hole stopper. Left-hand drainer/right-hand bowl or right-hand drainer/left-hand bowl: with these sink/drainer combinations, you need to get the configuration right when you order. Where to position the drainer? It's usual to position it over an appliance, such as a dishwasher, but ideally you need to consider how it fits into the worktop and preparation space overall before deciding. Kitchen sink manufacturers provide plumbing kits so that the outlets can be connected to the waste pipe. Check whether yours is included in the price of the sink. Your kitchen sink may come with added accessories. Look out for: food preparation boards; colanders; and drainer baskets.